Things are clearly hotting up. This week I had another interview with Boxing News magazine and next Friday, Sky Sports are in town and have asked for an interview. I’m proud of myself. In boxing terms, I’ve come very far. I went without a promoter for ten years. When I look back, the U.K. boxing industry gave me little support and just couldn’t force itself to believe that I might just achieve something in my career. It was not a pleasant or positive feeling. It might have been easier to just give up! However, sometimes adversity can provide the biggest motivation. I was to become the British champion, a world title challenger, ranked in the world top 5 of the WBA, WBC and IBF organizations through the years. I’ve fought the best of my era, achieving 40 career wins. Only one other active British fighter has more wins than me. I have an 83% winning record. Not a bad outcome, even if I do say so myself. I’ve dropped 20lbs over the last few months. I’ve pushed my body whilst I was in London at All Stars Boxing gym, and I stepped it up here in Las Vegas at the Mayweather Boxing Club with Lou Del Valle and Marcele Johnson. Lou has been ecstatic with my progress with him. The aim is to go out there on Tuesday 22nd August and get the win in style at Sam’s Town Casino. 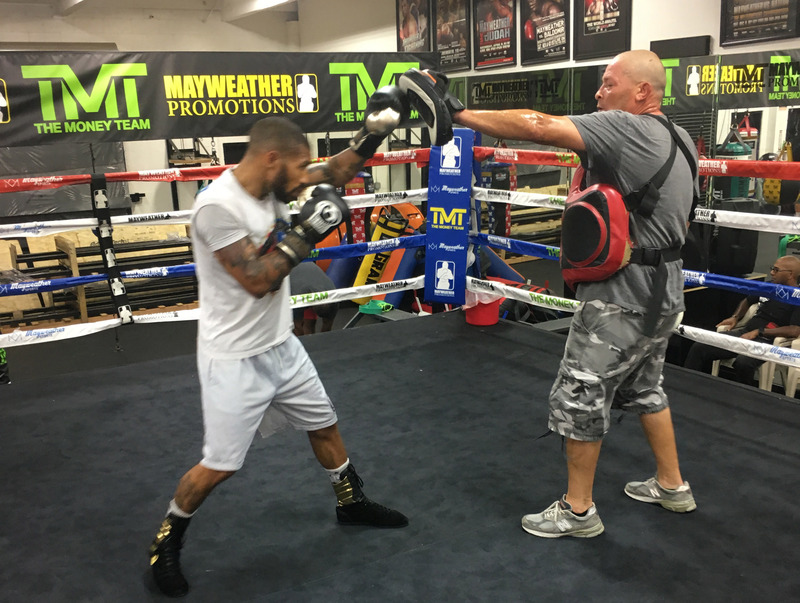 IBF 130lbs champ and Mayweather Promotions team mate, Gervonta “Tank” Davis is in town now, and has looked phenomenal in sparring. I’ve watched two of his three sessions this week. I think he has everything; 22 years old, skills, speed, power and the ‘IT’ factor. If he hasn’t stopped his opponents during sparring he’s bloodied and beat them up. He’s definitely entertaining. He even sparred a British fighter that is 3 to 4 weight divisions above him, and his power was troubling him. Tank will be a problem for anyone at 130lbs. He’s only going to get better. Months have turned into weeks now, I’m days away from my 49th professional fight. My 10th with Mayweather Promotions over the last 4 years. 8th in Las Vegas, Nevada. I’m proud of what I achieved out here. It couldn’t have been achieved without René Carayol. Through the ups and downs, thick and thin this man has stood by me. Team work makes the dream work. This week I was given the name of a potential opponent. Hopefully the Nevada State Athletic Commission approve him and it’s show time. 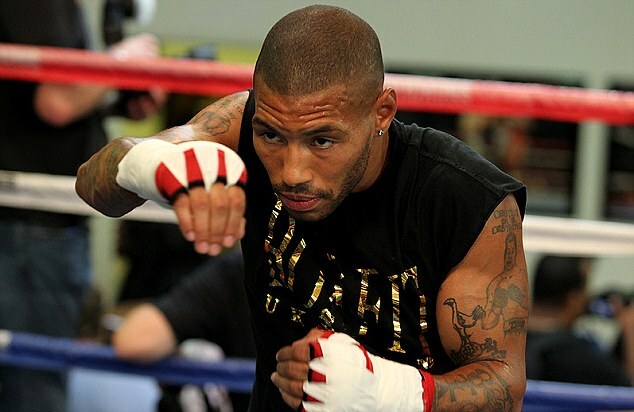 Badou Jack is fighting another Brit. He seems to love facing them. First, George Groves, then James DeGale and now Nathan Cleverly. Badou and I completed our last Mount Charleston run on Saturday. He’s ready to go and so am I. Five weeks of unrelenting hard work in Las Vegas. I’m giving everything I can and my mind and body are tired. My team and I are focused and pushing hard towards Tuesday 22nd August. That is the day of the ‘fighter arrivals’ when Floyd Mayweather will meet Conor McGregor at most likely the MGM Grand. Gervonta Davis is the co-main event. Badou Jack will be challenging Nathan Cleverly for his WBA ‘regular’ title and Shawn Porter will be facing Thomas Dulhome on the preview show. It’s a good TV card. Ishe Smith and I will be fighting at Sam’s Town Casino. I got my 40th professional victory there in December. Ronald Gavril has got the opportunity to face David Benavidez for the WBC title vacated by Badou. That will be on September 8th in Los Angeles. Ronald is one of the nicest guys you’ll meet. I wish him the best! He was due to fight at Sam’s Town as well, until this opportunity came up. Christy Martin was in the gym this week. She came up to me to ask me for a photo. I told her I should be asking you. “You’re the legend”. “The Coalminers daughter”. I remember in the 1990s when she was highly featured on Mike Tyson’s shows in Las Vegas. IBO world champion, Chris Eubank Jr, was also in the gym this week working out. The 5th ‘back to school’ drive was this week. The Mayweather Promotions fighters turned out to support the special goal of giving back to the kids of Las Vegas. Floyd Mayweather was on top form this week. He made one of his sparring partners ‘take a knee’ four times. He made another quit during sparring, running out of the gym. He’s amazing, at 40 years old and the man is still going strong. It’s 2 more weeks until I have my 49th professional fight. I never thought I’d get this far when I turned professional 14 years ago. I currently have 40 professional wins – 10 more wins until I retire. It’s been an interesting and fascinating ride. Boxing is truly a roller coaster. Nothing is guaranteed. I’ve managed to achieve things that many said I had no chance of doing whilst lasting longer than a lot of British boxers of my era. Very few are still around that turned professional 2002 to 2004. That alone shows how well I’ve done but it all must come to an end – one day. Life after boxing is now obviously on my mind, but that itch to compete that has always fuelled me is very hard to go without. I have worked extremely hard to be constantly motivated and in peak conditioned to fight. To push my mind and body to breaking point and it is still there. Will it ever go? I doubt it. It’s the competitive drive in me that fuels me to achieve my goals. I’d love another world title shot. I’d love to be British champion again. While I’m focused on my boxing career and achieving 50 professional wins. I know that my life after boxing is approaching and I also need the same motivation and preparation for whatever I choose to do next. That’s the future, for now, it’s all about Tuesday 22nd August at the Sam’s Town Casino, I’ll be having my 10th fight with Mayweather Promotions. Three weeks of a tough and unrelenting training camp in Las Vegas, Nevada. It couldn’t be going any better. 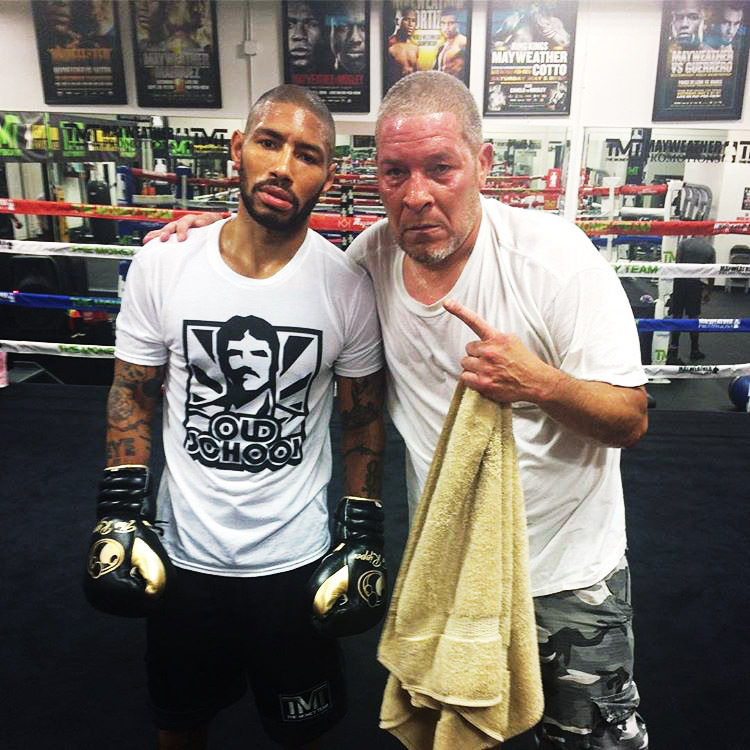 My head coach, former world champion Lou Del Valle, and my assistant coach, Marcele Johnson, have been instrumental in getting the best out of me in the boxing gym. I’m now 36 years old and still hanging with tomorrow’s stars of boxing in terms of fitness, strength and determination. The one thing that I always have on my side is experience. No matter how promising you are, you just cannot buy that. That’s comes through the ups and downs, the hurt and pain, and the glory of having gone through everything possible to get there. The Championship fights, brutal 12 round battles and the times you have to bare your soul for what you believe in. 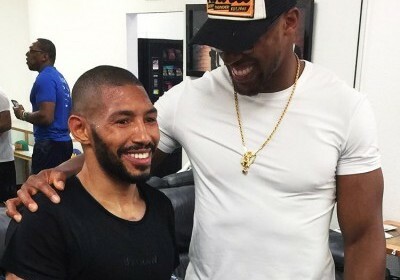 Anthony Joshua has been in Las Vegas this week. He came by the gym a couple times to hang out. He got a great reception in the gym and it was nice to see my fellow Brit in town. He’s a really decent guy and we got on well. He’s rumoured to be fighting here in late October, early November. He has everything going for him and has a bright future ahead of him. I’m due to fight Tuesday 22nd August in Las Vegas. There’s now 4 weeks until show time. A couple of names have been mentioned, but nothing is locked in yet. Hopefully this week my opponent for my 49th professional fight will be announced by Mayweather Promotions. I’ll just continue with my training to the best of my ability. The Floyd Mayweather v Conor McGregor extravaganza could break all boxing records financially. Whilst being controversial to many, this is a huge event and potentially brings a whole new audience who are not the usual boxing aficionados. The sport of boxing and mixed martial arts coming together. The two biggest names of each sport. It has financial success written all over it. I’m looking forward to fight week as Las Vegas will be buzzing maybe even more than usual. Fight fans, non-fight fans, boxers and the media from around the globe will be in the city of Las Vegas for what is due to be the event of the year. It’s been a great week in Las Vegas, Nevada. I’ve been working hard; my body is sore but my mind is determined as always. I feel like I’m still improving even at the age of 36. I fight a week before my 37th birthday. We saw the great role model Venus Williams reach two Grand Slam finals this year. The ageless and still brilliant, Roger Federer reached the Wimbledon final as well. As we get older. our mind and experience take over from what our body can no longer do. That’s what helps all older athletes have longevity at the top. Floyd Mayweather and Conor McGregor went on a world tour to promote their superstar event. I attended the Los Angeles leg of the tour. It was fun. 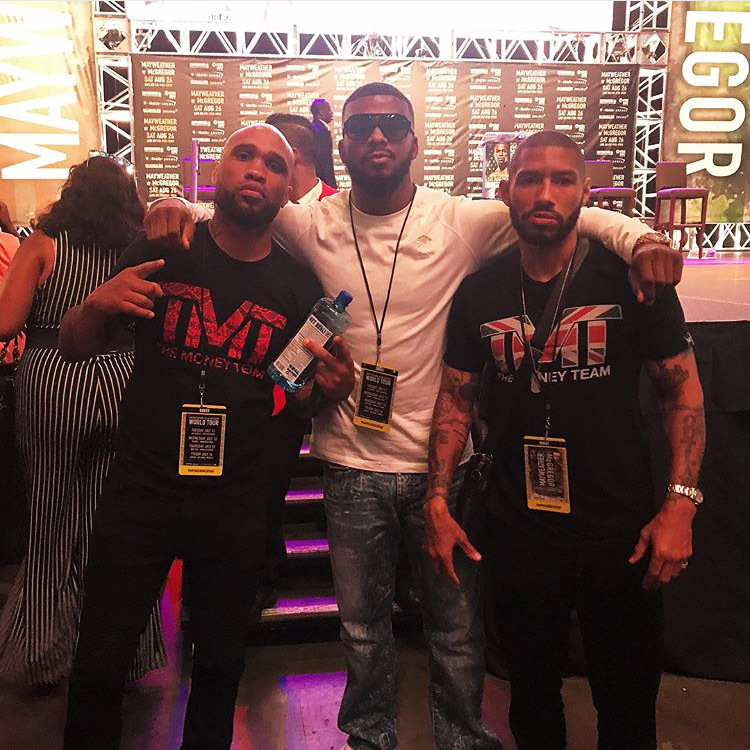 Floyd was happy to see Badou Jack, Ishe Smith and I, all there in support of him. He supports us and we support him. It’s a two-way thing! I’ve started back at Sub Zero Recovery to help my body recover with cryotherapy. I feel the benefits. The hyperbaric chamber will be seeing me soon. Weekly massages are also a must. Train hard and recover smartly. All boxes need to be carefully ticked. 530am: 90-minute Bikram yoga sessions. 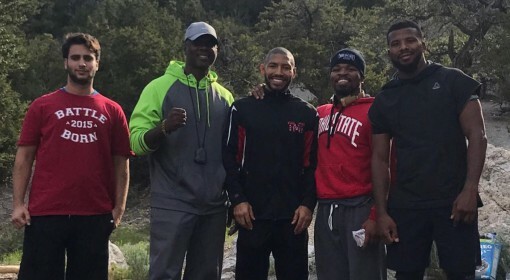 Weekly 6am mountain runs up Mount Charleston with the likes of Badou Jack and Shawn Porter. 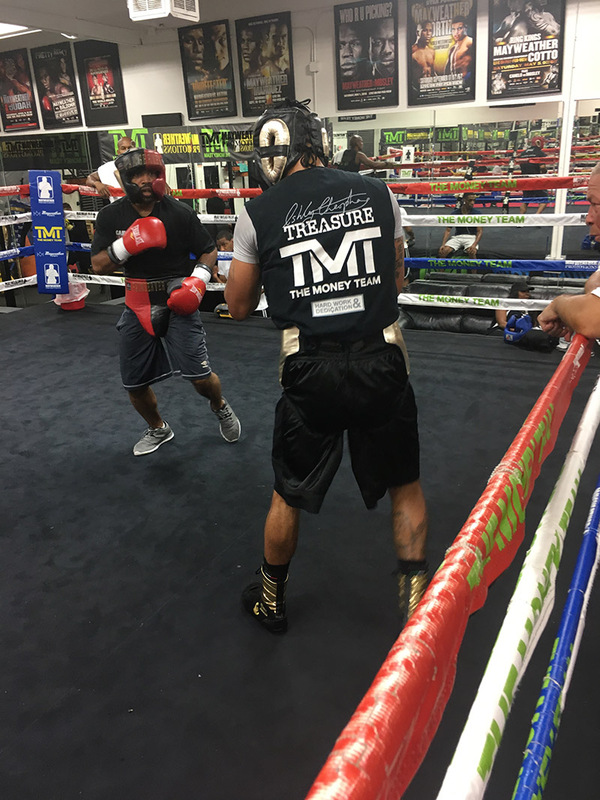 Sparring some tough fighters at Mayweather Boxing Club. Experienced fighters and young stars of the future. It’s gruelling, but it has to be done. I’m on the tough and lonely road to another world title shot. There’s no room for error. It would appear to have been a less than perfect couple of weeks for two fighters in the UK that share the same last name. Robbie Davies and Ohara Davies have both gone out of their way to call me out numerous times this year. They both stepped up in terms of opposition in their respective most recent fights and failed to make the grade. One quit and one was stopped. Losses happen, but please, walk before you can run lads. 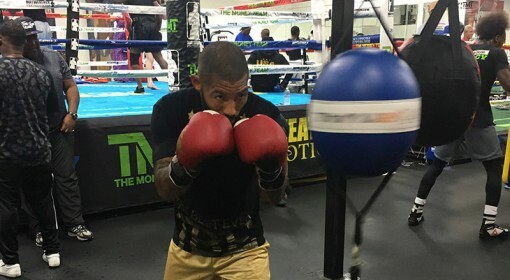 I’ve fought the likes of British champion Lenny Daws, European champion Jason Cook, two weight world champion Danny Garcia, four weight world champion Adrien Broner, world champion DeMarcus Corley, two-time world title challengers Pablo Cesar Cano and Delvin Rodriguez. There’s a big difference in my opponents and theirs. I’ve fought the best of Britain and the best the world has to offer. I’m about to have my 10th professional fight with Mayweather Promotions and my 8th fight in Las Vegas. I’m truly living my dream. A sportsman’s life is filled with ups and downs, which is why it’s important to give your all and surround yourself with a great team that will help you ride through the hard times. Loyalty is hard to come by. Make the most of the journey. It’s a short career. I’ve been back in Las Vegas for a full week now. Training camp is in full flow. It’s been a good first week with my coach, former world champion Lou Del Valle. He’s been impressed with our promising start. My weight is great, my body feels good and my mind is ready for whatever this camp throws at me. I’ve achieved 40 professional wins during my 14-year career. 7 loses and 1 draw. 3 of my losses were to 4 weight world champion, Adrien Broner, 2 weight world champion, Danny Garcia and 2-time world title challenger, Pablo Cesar Cano. This will be my 10th fight under Mayweather Promotions and my 8th in Las Vegas. All of this from a kid from the poverty stricken W9 area of London. Not much was ever thought of me as a kid. Even my own view of my future wasn’t too bright or positive. But with maturity and coming into contact with some special people, even as a 36-year-old man, I’m now optimistic for what the rest of my career holds and life after boxing. 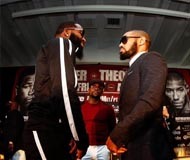 The upcoming huge Floyd Mayweather v Conor McGregor PPV telecast was due to feature Gervonta Davis, Badou Jack and JLeon Love. 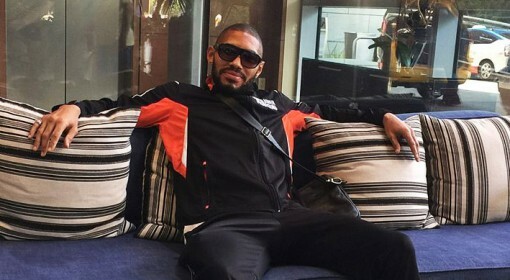 JLeon was set to fight David Benevidez. David Benevidez is now due to fight Anthony Dirrell in a world title contest so therefore unable to feature against JLeon Love. I heard it through the grapevine that I would be fighting Mario Barrios. A Mexican with a 19-0 record. 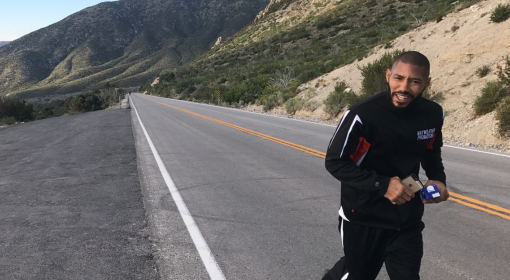 He trains out of Virgil Hunter’s camp, with the same training team as Amir Khan. I’m sure I’ll find out if the rumours are true this week. Nothing is ever secret in boxing. Whomever I fight, I’ll be ready for war on the biggest boxing event of the last two years. On Wednesday 14th June at around 1230am in the morning, there was a devastating fire at the Grenfell Tower block in Latimer Road. This is close to where I grew up. It’s heart-breaking to see the footage of the building on fire. I had friends that witnessed the Tower block in flames with the screams of the residents for help gripping their chests so tightly. I had tears in my eyes as I watched the news that morning. I met a few survivors but there were 120 flats with 600 occupants. Under 100 people have been rescued, so logically, there are 500 that are still “missing”. Days have now passed by and they still have not been found. For whatever reason, the media are reporting low numbers of deaths. Everyone on the ground knows it’s in the hundreds. Tension is building! Residents of the surrounding area are upset and mad at the lax manner that the situation has been handled by the council that runs the borough of Kensington and Chelsea. There is no support on the ground from the council or the Kensington and Chelsea Tenant Management Organisation (TMO) that badly managed the blocks in the first place. Those who are responsible for this tragedy need to go to prison as too many lives have been lost, and all due to the continuous cost cutting measures. It is worth just reminding everyone that this was corporate manslaughter, this is already clear from the available information and the stories of the survivors. The leader of the Labour party, Jeremy Corbyn visited the area and many locals were very pleased to see him and instantly rallied around him. He met with survivors and showed genuine concern. Prime Minister, Theresa May, came twice and never met any survivors. I happened to be there to witness the anger and frustration of the locals as Theresa rushed away into her Range Rover. She appears totally out of touch and has no understanding and has zero empathy with what they have been through. Her handling of the situation has been terrible and shameful. As I looked at Grenfell Tower, I was filled with sadness and sorrow for the people that had to go through this catastrophic event. Its soul has gone. The women and men, the elderly and the kids that died in there is beyond cruel. Survivors have heart rending stories about tripping over bodies on the landings and on the staircase as all tried to save their lives and the lives of those who were struggling to get out on their own. I was born a mile away from Grenfell Tower. My heart goes out to everyone who lived in that building – alive or dead. It’s been touching and progressive to see London come together, volunteer and donate but under these circumstances it is too high a price to pay for us coming together – it’s very painful. I’m a proud west Londoner. We are more than a community. We are family. It will never be the same again in that neighbourhood. It’s been a very long training camp that saw me start off in London and end it this week in Las Vegas. Five months of work for one victory. Sacrifice and dedication have lead me to my 40th professional victory in my 14th year as a professional. Only three other active British fighters have more wins than me. Being active for so long is hard to do in boxing. I’m on the final stretch of my career, but what a career it has been. British champion, International champion three times, world title challenger. I’ve now fought and won in five countries. I’m proud of myself but I’m not done – just yet. I attended the recent mega fight between Andre Ward and Sergei Kovalev at the T-Mobile arena. This fight was the biggest since Floyd Mayweather fought Manny Pacquiao. I was sat next to boxing legends Lennox Lewis, Pernell Whitaker and Ronald ‘Winky’ Wright plus current WBC super-middleweight champion, Badou Jack. Not bad company to be surrounded by. The UK’s number one promoter, Eddie Hearn, was sat just behind us. 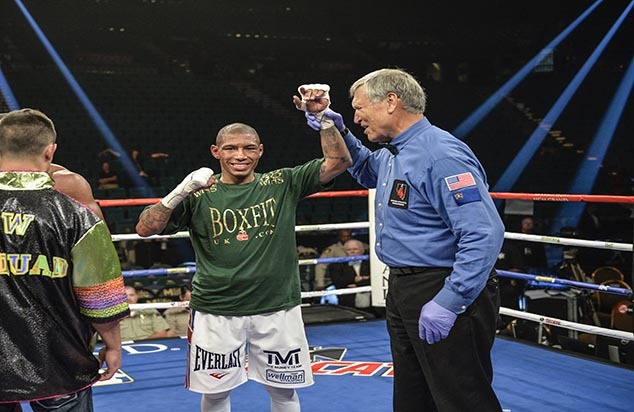 Robert Byrd, who refereed the mega fight, has been keeping his refereeing skills sharp at the Mayweather Boxing Club. It was a fantastic experience to have him work closely with us, refereeing my sparring sessions. 2017 looks to be a massive year for me. I closed 2016 headlining in Las Vegas. I’m a kid from Paddington, west London. Floyd Mayweather has let it be known he wants me to get back into big fights, so that’s great motivation. The hard work and incredible story continues. To think I made my debut at York Hall in Bethnal Green. Some 13 years later I’m headlining in Las Vegas and part of Floyd Mayweather’s boxing team. I’m lucky to have great team around me. Without them I would never have gotten this far. So, thank you to them. What a way to end 2016 with victory number 40. Ashley ‘Treasure’ Theophane was born in Paddington, London on August 30th, 1980. He dreamed of becoming a professional boxer as a child. At 5 years old, he would stay up watching all the big fights in Las Vegas and hoping to one day become part of the boxing industry. After taking up boxing in his younger years, Ashley decided to make his dreams a reality when he turned pro at the age of 23. 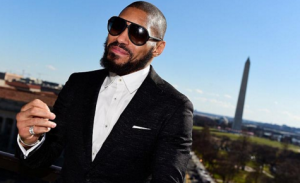 He is now based in the entertainment capital of the world and has elevated his career within the sport of boxing as part of the Mayweather Promotions team. 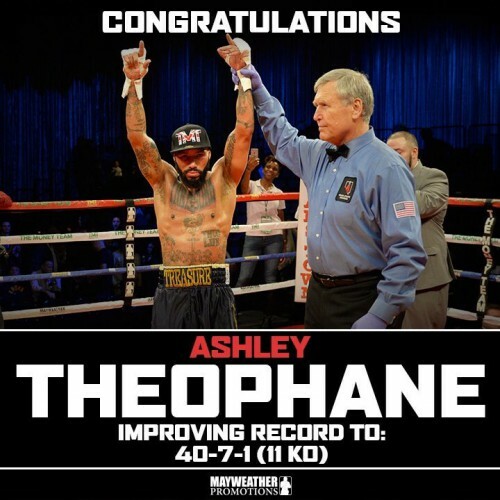 Read below to find out more about our featured fighter, Ashley Theophane. Q: Which athletes did you look up to the most growing up and why? As I was growing up, I looked up to Michael Johnson, Mike Tyson, and Andre Agassi. They were the best at what they did and entertained audiences at the same time. I took up boxing, tennis, and other sports because of them. 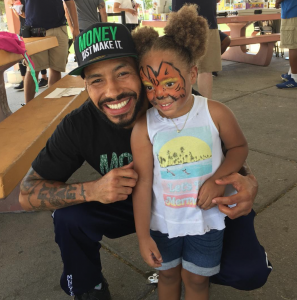 Q: What’s the best part of being a professional boxer? To me, there are many positive aspects when it comes to being a boxer. I’m originally from London and now based in America. I’ve had the opportunity to travel the world. I’ve had fights in America, Saint Lucia, Germany, and Luxembourg. I’ve met so many people throughout my career. I would never have the opportunity to meet these people if I wasn’t a pro boxer. It’s an amazing feeling to achieve your goals. Q: What is the most challenging thing for you in this sport? The most challenging for me is the sacrifice you have to make to achieve your dreams. You need tunnel vision. You need to work hard and dedicate your all to what you’re doing. I’m very focused. All my energy goes to this sport. It takes a very strong-minded person to be a pro boxer. Q: How did you get involved in boxing? I used to watch boxing with my dad when I was around 4 or 5 years old. It was just something I always wanted to do. I would see all the big fights in Las Vegas and just remember thinking that I wanted to be a part of that industry. It has motivated me to continue accomplishing my dream. Thirty years later, I’m now based in Vegas and signed to the number one boxer in the world. That’s an incredible experience in itself. Q: What has been the biggest motivation for you to pursue your goals? Like I’ve mentioned before, I’m originally from London. I was born in the city of Westminster and raised in Brent. I was surrounded by poverty and crime as a youngster. I didn’t want that life for myself. I wanted to go out into the world and live my dream. Making a better life for myself has always been the motivation. Q: What are the most memorable moments in your career? 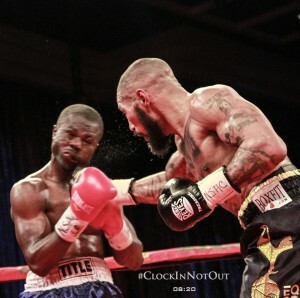 Some of the most memorable moments for me were fighting in my father’s homeland of St. Lucia, becoming the British champion, beating Delvin Rodriguez in July 2010 was a surreal experience, and not to mention, getting signed to Mayweather Promotions. That’s just incredible. These are the four things I’m most proud of. I feel incredibly blessed. All these experiences all lead me to where I am now. Q: You have twenty seconds to give advice to someone who wants to pursue a career in this industry. What would you say? You need to surround yourself with a great team. That’s the key. You only can do so much by yourself. You need a great team to support you and believe in you. The people behind you can lift you to great heights if you work hard and dedicate yourself to the sport. Q: If you could act as a character in any movie, which character would it be and why? I’d love to be Superman! I would love to have the ability to fly around the planet and save people. That would be so much fun. I have to admit though that sometimes I feel like I have super powers! Q: What other sports do you enjoy playing or watching? I really enjoy swimming! That’s something I like to do in my free time. I watch tennis, soccer and other sports, but tennis and soccer are mostly what I gravitate towards. Q: What would you like to say to your fans? I’d like to thank my fans for the support and well wishes. I’ve received so much love in London. It’s amazing. My fans in America and across the world have all really shown me a lot of support as well. I just want to thank them all so much for all the love! Against all the odds, I got myself to the pinnacle of boxing. The Mount Everest of my sport. I fought the biggest name in my division, and held my own for eight rounds. Two of the judges had me winning rounds one and two. Through eight rounds of boxing I won four of the rounds on the judge’s scorecards. There was four rounds to go with absolutely nothing in it. I had won rounds six and seven. Adrien seemed to be feeling the pace. I had started the fight well. In the middle rounds I closed the gap. Then suddenly the referee stopped the fight, immediately after I was hit with an illegal low blow in the ninth round. He completely misread my reaction – I told him I’d just been hit low and to my amazement, he stopped the fight. I was shocked, stunned and hugely disappointed by his actions. Many in attendance and viewers watching across the world were as confused by the referee, Luis Pabon. Leonard Ellerbe, President of Mayweather Promotions, had just come to my corner to say “You’re doing good”. My dream was shattered by a bad mistake from the referee. I gave my all for eight rounds, therefore I have no regrets. Over the next two days, the residents of Washington DC surrounded me and were warm and generous with their praise and their feelings. They showed me genuine love. I honestly couldn’t go to the bathroom without being asked for a photo. It really mattered a lot to me. The many messages of support from across the world were really heartfelt and touching. 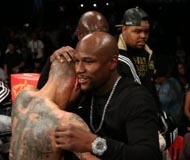 Floyd Mayweather shared with me that after a couple more wins and I’ll be fighting for the world title again. I appreciate this man so much. People don’t get to see the caring side of him and what a good and huge heart he has. I’ll forever be grateful to him. 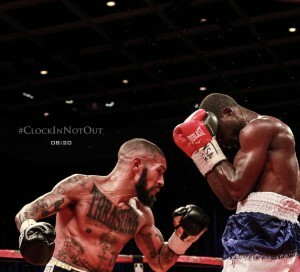 Adrien Broner sent me a text message and tweet to say what a great fight we had and how tough I am. For a 12-1 underdog, I held my old with a four weight world champion, a young legend. I’m still disappointed I didn’t win. It hurts me that it didn’t go the twelve rounds. I believed 100% I would win. Floyd told me before the fight. “Go out there and give your best. Win this title and be a part of history”. 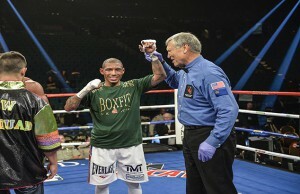 I really tried, but referees make mistakes and the referee’s one mistake, cost me the fight. The last few months have been amazing. My training team did a remarkable job. I was in the best shape of my life, so huge thanks to Dave Brown, Nate Jones, Bob Ware and Marcele Johnson. Floyd Mayweather, Al Haymon, Leonard Ellerbe and Dejuan Blake thank you for the opportunity to change my life. I’m forever grateful. Last but not least, René Carayol, we met exactly five years ago. We had a goal to get to where we now are, and thank you for seeing the potential in me I really never saw. To my Mum, Dad and my brother. It was great to see you guys here in America. Thank you for believing in my dream for so many years in London. I owe you guys everything. I’ll be back! Stay tuned. So, we are here in the nation’s Capital. Washington, DC. I’ve always wanted my career defining fight and Floyd Mayweather has kindly delivered it for me. Adrien “The Problem” Broner, the four weight world champion. The biggest name in my weight division. And of course I’m the underdog, but I wouldn’t have it any other way. I’ve been the underdog my whole life, my whole boxing career. It’s been a hell of a struggle, but at the same time I’ve had loads of joy along the way. I became world number 4 against the odds. I became British champion. I have shared the ring with some accomplished fighters like Delvin Rodriguez, Danny Garcia, Pablo Cesar Cano, DeMarcus Corley and Lenny Daws. I signed to Mayweather Promotions in 2013. I’m very proud of myself. I now have my biggest challenge, Adrien “The Problem” Broner. I’m relishing it and looking forward to it, as I believe I can win. I set high expectations of myself. On Fight night, I aim to make myself proud with my career best performance. We had the final press conference today. Adrien was his usual self. I kept calm and composed. I’m confident. It’s just about performing on fight night. The weigh in is tomorrow at 1pm and then battle will commence Friday night at the DC Armory. I’m currently WBA world number 9. Friday I aim to be the WBA world champion. 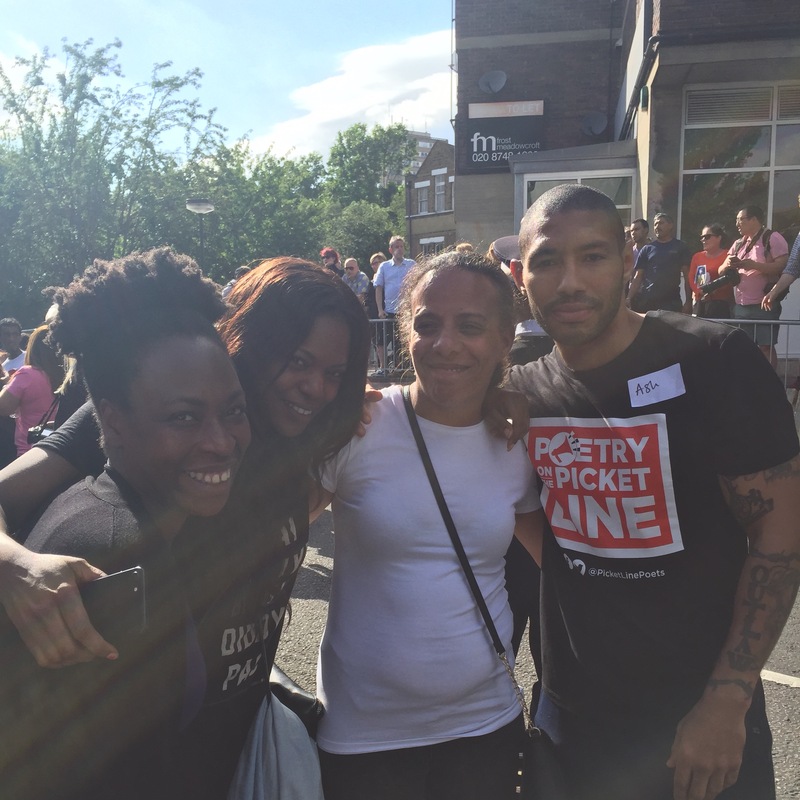 AshleyTheophane @Jo_Coburn @BBCPolitics I did miss “Politics Live” last week. Glad you guys are back.